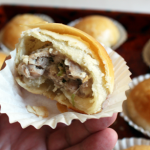 This curious little round pastry is made from a flakey wrap that encloses a ground pork filling made with aromatic seasonings tasting almost like meatball. The restaurant claimed these pastries originated in Shanghai. But I later learned from a friend from Suzhou (蘇州) that in fact they originated from Yangzhou (揚州) in Jiangsu (江蘇) province near Shanghai. Although no one really knows when they were first introduced, they have become so popular around the Yangtze River delta region that major cities in the area claim they are indigenous. For me it is refreshing to taste a mooncake with savory filling. Even though there are many sweet mooncakes made with pastry wrapper, the pork filling creates a different quality to the pastry. Like they have with sweet mooncakes, many bakeries have become innovative with the filling and have created many variations such as pork and pickled turnip, and pork and ham. 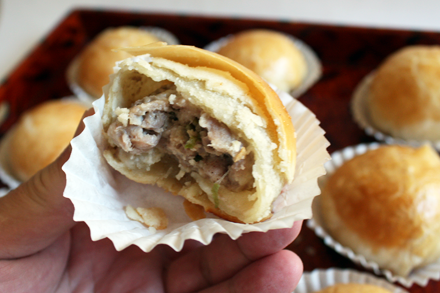 I have included a recipe for traditional pork filled mooncake below. Unlike sweet mooncakes, which can be made ahead and stored for later consumption, this pork mooncake should be served immediately. In fact it is best served piping hot straight out of the oven. 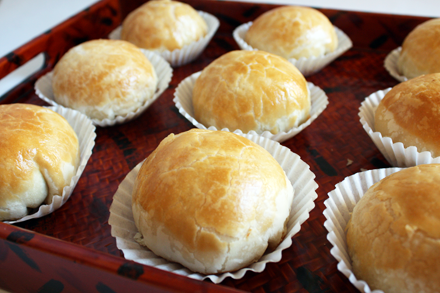 They can be stored in the refrigerator overnight but the pastry will loose its flakiness after reheating. This year my schedule just before the Moon Festival has been absolutely crazy. I’ve not been able to publish a single blog post for a month. My attempt in making some traditional mooncakes in a rush as gifts failed miserably. 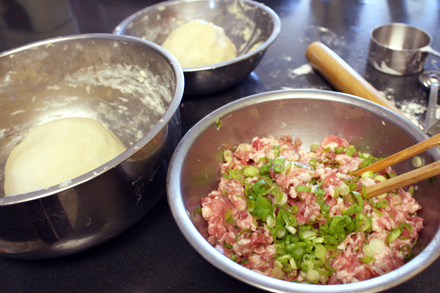 So I am making savory pork mooncakes at the last minute for our family reunion dinner. First make the lard dough. Sift the flour and salt together, and then cut the lard into the flour until well mixed. Then add the water and knead the dough until smooth. Then make the lard cake by cutting the cake flour and lard together until well mixed. Set both aside. Combine the ingredients for the ginger scallion water in an electric blender. Blend the mixture together until completely pureed. Strain the liquid using a mesh strainer and discard the fibrous residue. Set aside. In a medium mixing bowl combine all the filling ingredients and mix well. Divide both the lard dough and lard cake into ten equal portions by rolling each into a long cylinder of about 1/2 inch diameter and cutting into equal pieces. Flatten one portion of the lard dough and roll it out with a rolling pin into a three-inch diameter round. Roll one portion of the lard cake into a ball and put it in the center of the lard dough. Wrap the lard cake with the lard dough and roll the dough into an oval shape sheet of about 1/8 inch thick. Start from one end of the long side of the oval and roll the dough into a cigar shape. Then us a rolling pin and flatten the cigar shaped dough into a flat ribbon. Once again roll the ribbon into a short cylinder. Flatten the cylinder and roll the dough into a round of about 1/8 inch thick. Divide the filling into ten equal portions. Put one portion of the filling into the round dough. Wrap the filling completely by gathering the edge of the round and pinching tightly. Turn the mooncake and put the seam side down onto a greased baking sheet. 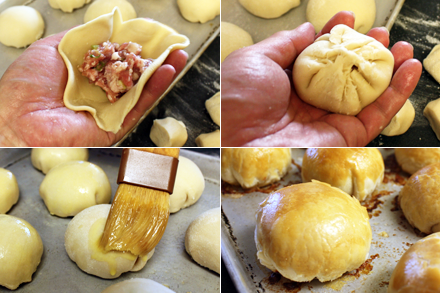 Repeat the wrapping process for each portion of the dough and filling. Preheat the oven to 375°F. Whisk the egg in a small bowl until completely mixed. 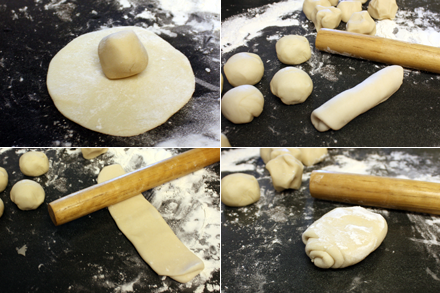 Use a pastry brush to apply the egg wash to each of the mooncakes. Bake the mooncakes for 20 minutes or until golden brown. Serve immediately. 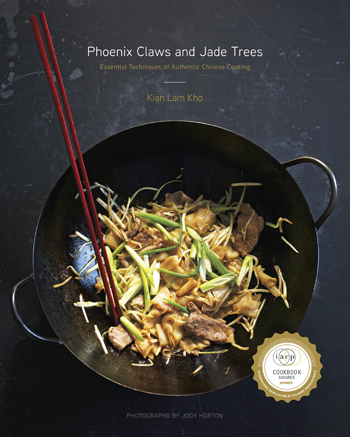 Kian, I have never made these, but is one item I will add to my culinary “ToDo” list. Always enjoy learning about your culinary culture and heritage. Hello! I am VERY new to mooncakes! My children recently watched a movie that had mooncakes and really would like to try them. Are the mooncakes from the recipe above able to be pressed in a decorative press? I think the beauty of them are what intrigued my little ones the most. I would love to try these for dinner! Thanks so much for posting your recipe! The sweet mooncakes are made with the decorative mold. It is tricky to manipulate the mold to create a perfect cake. So don’t be discouraged if your first attempt is not very successful. Practice a few times and you will be able to create some very tasty cakes. Looks awesome! Going to try it this weekend. Any idea how many this recipe will make?